2002 2003 2004 2005 Land Rover Freelander. Motor Included. Our hours of operation are 1 year limited warranty. 2002 2003 2004 2005 Land Rover Freelander. Motors Included. Our hours of operation are Visually compare the part you are replacing with our pictures above. 1 year limited warranty. Part # YUF101521LNF, YUF101520LNF. Discovery II. 1997-2006 Land Rover Freelander. All Five Doors Window Regulator Repair Kits. We only warranty the cost of parts. Confirm the item(s) will install and operate properly before use or modification. 1997-2006 Land Rover Freelander. Both Front Heavy Duty Window Regulator Kit. Modifying an item in any way will void the warranty. We only warranty the cost of parts. Confirm the item(s) will install and operate properly before use or modification. 1997-2006 Land Rover Freelander. Modifying an item in any way will void the warranty. We only warranty the cost of parts. Confirm the item(s) will install and operate properly before use or modification. 1997-2006 Land Rover Freelander. Right Front Heavy Duty Window Regulator Kit. Modifying an item in any way will void the warranty. We only warranty the cost of parts. Confirm the item(s) will install and operate properly before use or modification. 1997-2006 Land Rover Freelander. 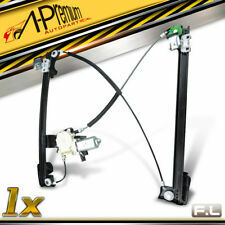 Left Front Heavy Duty Window Regulator Kit. Modifying an item in any way will void the warranty. We only warranty the cost of parts. Confirm the item(s) will install and operate properly before use or modification. We do not compensate your labor, towing, repair, rental expenses or any other related expenses. Used PASSENGER side FRONT, Window regulator with motor. Used in good working condition, normal wear for age, Used OEM part. 2002-2004 Land Rover Freelander HSE 6Cyl 2.5L 153CID. 2002-2003 Land Rover Freelander S 6Cyl 2.5L 153CID. 2002-2005 Land Rover Freelander SE 6Cyl 2.5L 153CID. 2003-2005 Land Rover Freelander SE3 6Cyl 2.5L 153CID. This Listing Contains: 1 - CUH000023 - Eurospare - Front Passenger Right Electric Window Regulator Without Motor New - Eurospare CUH000023 / LR006371 / LR0 06371 Window Regulator. This Listing Contains: 1 - CUH000033 - Eurospare - Front Driver Left Electric Window Regulator without Motor New - Eurospare CUH000033 / LR006372 / LR0 06372 Window Regulator. Land Rover Freelander S 2002-2005 Series I V6 2.5L Sport Utility. Land Rover Freelander SE 2002-2005 Series I V6 2.5L Sport Utility. Land Rover Freelander HSE 2002-2005 Series I V6 2.5L Sport Utility. Part # LR006371 ,CUH000023. Freelander 02 - 05. FRONT Window Regulator. RH - Right (passenger side). We also have the left front (driver side) LR006372 ,CUH000033. 2002 2003 2004 2005 Land Rover Freelander. Front Power Window Regulators made to fit and function like the original. Window Regulators ONLY. NOT Included: Power Motors. Our hours of operation are. 2002 2003 2004 2005 Land Rover Freelander. Window Regulator ONLY. NOT Included: Power Motor. Our hours of operation are 1 year limited warranty. Model: Freelander. Left Front Door/Window Motor & Regulator. If there are any issues with your order. We are here to help correct any problems there may be with your order. Our parts are designed for USA production models and may not cross fit for worldwide applications. Model: Freelander. Regulator With Motor. Right Passenger Front Door / Window. We are here to help correct any problems there may be with your order. Warranty: 2 Year. Part # LR006371 ,CUH000023. Freelander 02 - 05. FRONT Window Regulator. RH - Right (passenger side). Power Window Regulator Repair Kit Front LH Left Driver Side for 02-05 Land Rover Freelander. 2002-05 Land Rover Freelander Power Window Regulator Repair kit Front Driver Side.